Alligator and crocodile skin is a classic. This skin is the most high-quality and therefore very expensive. There are protuberances, which form rows 2-2-2 on the skin of the head of an alligator. The alligators, unlike crocodiles have a scar in the shape of a star. On this scar is located a pattern in the shape of cobweb. Designers show it in the most prominent place, as it proves the authenticity of the origin of the material. The lines on the skin of an alligator is a little chaotic, and pattern of scales are not geometric (as it is on the crocodile skin). Alligator skin is more expensive than crocodile leather. On the skin of the head of a crocodile protuberances are located in pronounced rows 4-2 . Designers locate this part of the skin in the most prominent place of the product. But as in the case of alligator skin, abdominal part of the skin is the most valuable and expensive part. Here, the pattern of scales is more geometric, and the lines that pass through them is almost parallel to each other. At each squares in the center is little point (Osteoderms) . 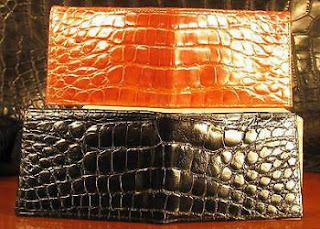 Crocodile skin wallets and alligator skin wallets may differ in price. Alligator skin is more expensive than crocodile leather. But both products are durable and does not lose its beauty in course of time.